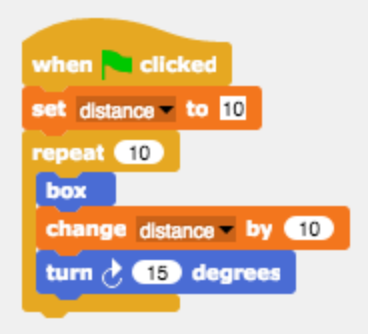 From the "box" block, I wanted the distance to increase each time it is repeated, so I turned made distance a variable. This was how my new code looked like (below); it was a success! This made me wonder, like the petal code (from previous blog post), how would I make the stitches smaller, while keeping the distance the same? Please comment suggestions. Thank you! In this pattern, the center "chips" are not showing up as the pattern on the screen - they just appear as little knots in the embroidery. Think it is because of the small size. I imported it in the new Turtlestitch Version, where you can zoom in to better inspect the pattern.